“Can you smell that?” said my friend shortly after we passed the sign letting us know that we had entered the Robertson Wine Valley. “Yup,” I said, “that’s the distinct smell of wine. We’ve definitely arrived at the right place.” We both giggled, stuck our heads out of the window and took in a deep breath. We were on our way to experience the Hands on Harvest weekend in Robertson and it was the perfect start. Our first stop was Klipdrift, where we watched a video on the history of the farm and learnt why the Klipdrift brandy bottles all have a clock on them. This was the time that JP Marais distilled his first brandy. No-one is sure whether it was in the morning or at night, but that’s the time he diarised. There’s always a story behind the label! Then for a tour of the distillery. We left our bags locked up in a cupboard as cellphones, lighters and cameras are not allowed in the distillery as they are flammable and we really didn’t want to blow ourselves up in brandy, even if that could be deemed a good way to go! So, these guys have steel tanks that hold up to 18 000 litres of brandy! And here’s a little secret – when they transport it they use unmarked tanks to avoid any attempted brandy hijackings. I immediately wondered if the sunflower oil tank we passed on the way was actually brandy in disguise. We went into the cellar where the barrels are stored (they only use French oak which is cured naturally in the sunshine) where the evaporation from the barrels made us feel quite light-headed. Turns out we are not the only ones – this evaporation is fondly known as “the angels share”. Heaven must be a very cheerful place indeed! After the tour we had a brandy tasting with food pairings. We got through the base wine, the heart and then the three different types of brandy Klipdrift produce. 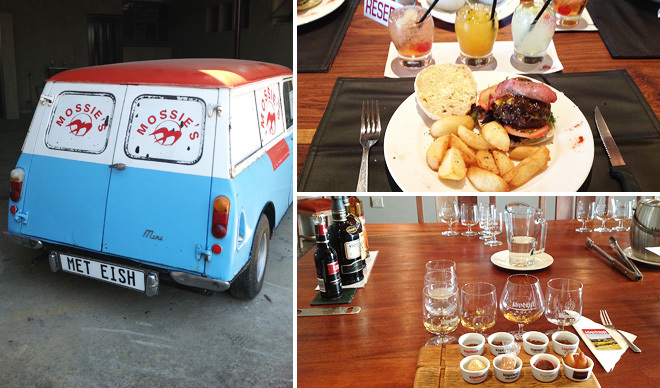 The tastings were paired with both savoury and sweet morsels of food which were well-chosen and delicious. They are kind enough to give you the recipes for the marinades which I am definitely going to try at home, with a nice glass of Klipdrift Gold! Lunch followed and I had the Klipdrift Burger which was divine and my friend thoroughly enjoyed her biltong salad. Lunch was accompanied with mini versions of four of their brandy cocktails. Met eish indeed! Armed with a small bottle of Klipdrift “harvested” from their vineyard at the back of the restaurant/bar, we set off for our next challenge, champagne making. Tel 023-626-3027,www.klipdrift.co.za. Our mission at Weltevrede Estate was to make our own champagne using a bottle that had been sitting in their underground cellar for five years. With many a bang and a squeal we all “disgorged” our bottles (the pressure is five times that of a car tyre!) and set about adding sugar, inserting the cork and labelling it. It was great fun and not always as easy as you think it looks. 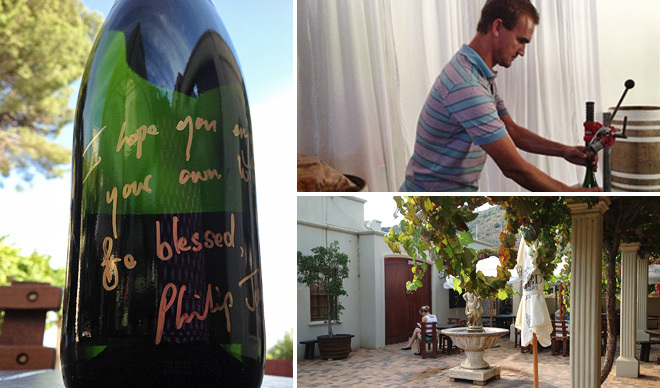 Phillip Jonker took us through each stage and finished off our creations with a personal message on the bottle. It was all very personal and hands-on and we now have a five-year old Brut Entheos that we made in half an hour! It was also a delight to meet the esteemed and rather delectable winemaker himself! Tel 023-616-2141, www.weltevrede.com. We popped into to our abode for the night to freshen up before our final activity for the day. 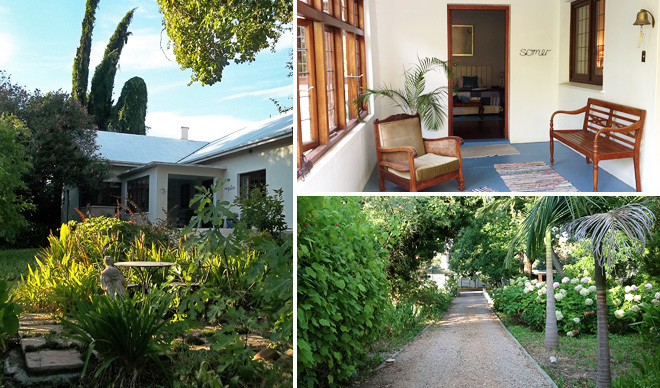 The Lemon Tree Guesthouse in Kerk Street is delightfully cute and has a beautiful lush garden, filled with birds by day and croaking frogs at night. We were amused to see that we had been booked into the “honeymoon suite”, but were quite happy with the lovely Victorian bath that came with it. The bath is in the bedroom though, so if you do book the honeymoon suite, make sure you are on honeymoon or still feel as if you are. The owner, Corieda, makes you feel very at home and the atmosphere is a country casual one. You get a key to the main house so you can use the lounge at any time. I have to admit that I raided their kitchen too (we needed more teabags and milk) and Corieda didn’t have a problem with that. In fact nor did the dog who simply ambled over, gave me a sniff and after getting a tickle on the head he went back to his bed. Mi casa, su casa is definitely the feeling you get here and it’s refreshing. 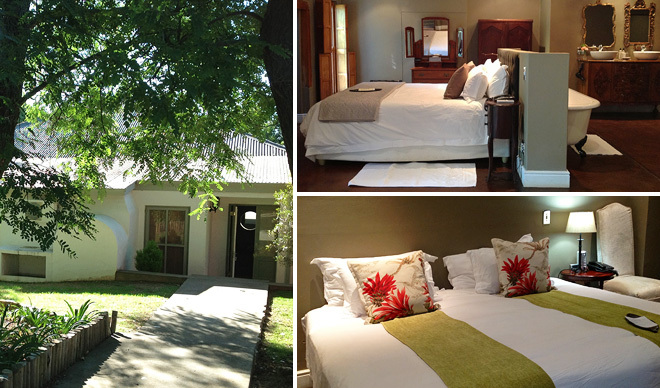 Tel 023-626-1384, www.lemontreehouse.co.za. 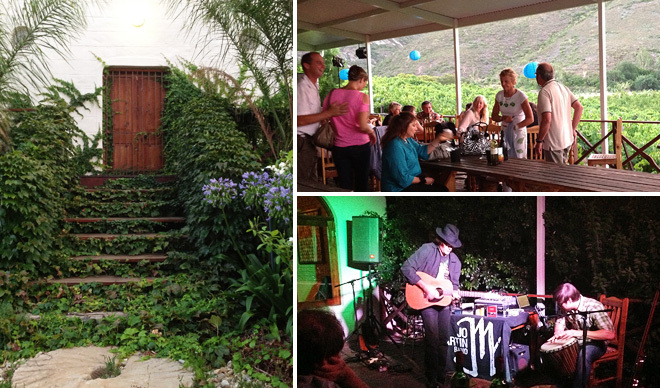 That evening was spent in the good company of the duo from Spit or Swallow at the Harvest Moon Soiree at Wolfkloof Boutique Winery, a mere ten minute drive away from the Lemon Tree Guesthouse. I had pictured us sitting on the lawn with picnic baskets listening to a man strumming on a guitar and howling at the moon. Instead we found a cheerful restaurant vibe with tables, not blankets, and our picnic baskets were replaced by big giant brown paper packets filled with yummy goodies like quiche, samosas, salami, cheese and pesto sandwiches and even some biscuits for dessert. The Jo Martin Band had us all tapping our feet to covers from Pink Floyd to Rodriguez and the night ended in a bang with a fireworks display. It was all so much fun that my friend didn’t want to leave. Apparently they have these “soirees” on a fairly regular basis, so if you are in town on a night that they have one I recommend you go. The views over their vineyards with the twinkling lights of Robertson below is worth it alone. Tel 023 626 3911, www.wolfkloof.co.za. We were up bright an early the next morning for a walk through the vineyards at Nerina Guest Farm, producers of Burcon Wines. Turns out that this was not a walk through vineyards, but rather a walk up a mountain to look out over the vineyards! But it wasn’t an entirely strenuous walk, rather an early morning amble along a farm road with the farm dogs leading the way and up a hill (okay, I huffed and puffed a little bit and I probably shouldn’t have worn flipflops). 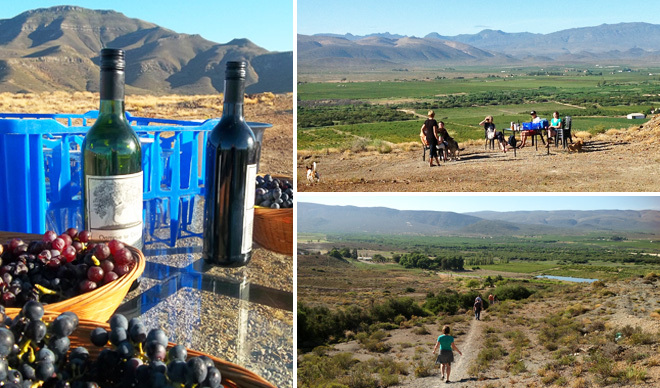 We were rewarded with astounding views over the neighbouring farms and lovely glass of Merlot. It was only 08h00 – not a bad way to start the day! Renee entertained us with stories about her family and the farmers in the area. One that I found particularly amusing was the story behind the rather buxom and contented-looking woman on their box of Muskadel. Apparently if you have a bottle of Muskadel and a willing woman, you don’t need heaven. Their Muskadel comes in a two-litre box so heaven can last a little longer! Quaffing Merlot and Muskadel first thing in the morning could lead to repercussions later, so it is a good thing that our walk was followed by a sumptuous Afrikaans-style breakfast on the Breede River. 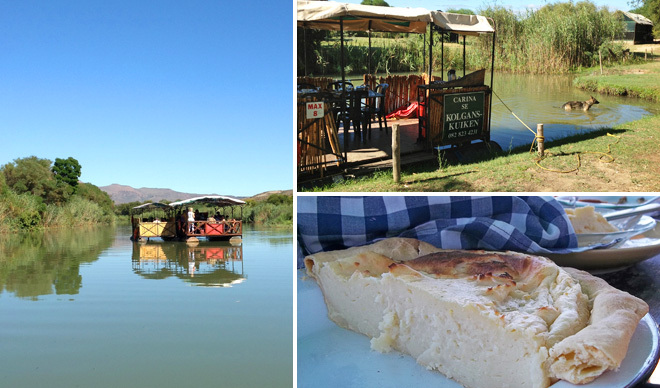 While Renee steered the boat down the river and the dogs slept at our feet, we feasted on roesterkoek, meatballs, cheese, poached eggs in a tomato relish and quiche. Washed down with orange juice and strong coffee to set us straight. As the grand meal finale we indulged in real homemade melktart. I am not a big melktart fan, but even I was impressed. While we tucked into breakfast we waved at campers on the river’s edge and watched children playing in dinghies while energetic rowers cruised along the sparkling water and fishermen attempted to catch a bass. The sun was shining, our tummies were full… it was sublime. Renee does these river cruises 365 days of the year (breakfast and lunch), but booking is essential. They also do horse-riding through the vineyards, er, up the mountain. Tel 023-626-2012, www.nerinaguestfarm.com. After meandering through the town centre, we stopped in at Ashton Kelder to get our feet dirty. This was definitely the most kiddy-friendly place we visited. There was a jumping castle and a small boy was enjoying grape juice in his own wine glass, which must’ve made him feel very grown up! Unfortunately we arrived a little too late for the grape stomping. It was a mushy red pulp by this stage and I bluntly refused to clamber into the barrel. Note to self: arrive earlier to squish grapes between my toes! But all was not lost; we thoroughly enjoyed the wine tasting paired with a tapas platter. We scoffed fried mushroom risotto balls paired with Pinotage, herb crumbed aioli paired with Chardonnay, sweet chilli chicken sosaties with Satynperlé, pita triangles with cheddar and pesto with Cabernet Sauvignon and boerewors in a sweet tomato smoor paired with Shiraz. There was not a crumb or drop of wine left by the time we were done and we purchased two bottles of wine each before they packed up the jumping castle and closed for the day at 15h00. The tapas platters cost R30 for three or R50 for five and although this was especially for the Hands on Harvest, they are considering doing this in the future. I hope they do! Tel 023-615-1135, www.ashtoncellar.co.za. 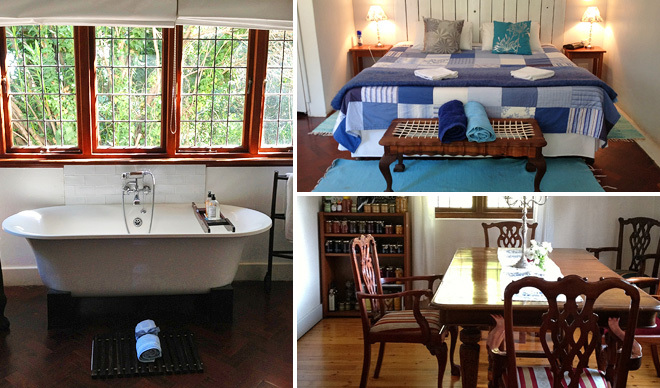 Our abode for the night was the very swish Jan Harmsgat Country House on the R60 between Ashton and Swellendam. One of the oldest farms in the area (since 1723) it now offers five-star accommodation in luxury rooms or standard rooms in the original slave quarters. They also grow grapes (and produce wine), have over 1 000 pecan nut trees along with orange trees, fig trees, olives and pomegranate trees. On the adjoining property, Laastewater, you can see wildebeest, springbok, grey rheebuck and ostriches. When we arrived at reception we were greeted by a motley crew of hounds followed by the fairly new owner of the farm, the somewhat charismatic Willie Malherbe. He introduced us to his family – Piston (who had grape juice on his back from running through the vineyards), Daisy, Buttercup and Dale, otherwise known as Donkey (a long story involving a dog whisperer), making us feel like we had arrived at the home of an old friend. But unlike most of the homes of our friends, our luxury room in Van Eeden House (built in the 1800’s) was gob-smackingly plush. We each had our own mini suite with an inter-leading door, with our own king-size bed, stand-alone baths (mine was Victorian), huge showers with equally huge shower heads, a television with selected DSTV channels, tea and coffee, a mini bar and snack basket. We were delirious! There were gilded mirrors, double basins, fluffy white towels and facecloths, dressing gowns, dimmer switches, chandeliers and my favourite, a little porcelain duck that contained bath salts. Outside there were recliners set under lush trees and around the corner was an abundant vegetable garden (they use their own produce in the restaurant where possible). We poured ourselves a sherry and put our feet up before heading to the restaurant. Could this weekend get any better? Willie joined us at the restaurant for a cocktail and after many an amusing tale and a quick tour of the grounds we were left to enjoy our evening of food and wine. 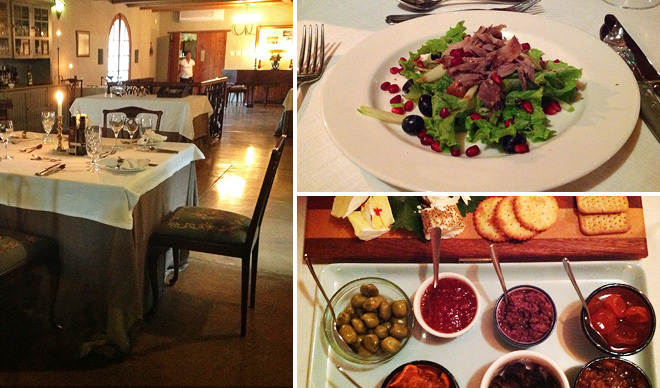 Five courses of gastromic delights followed – Sauvignon Blanc Grape Gazpacho, Grilled Duck salad with the farm’s Ruby Cabernet grapes and pomegranate vinegarette and grilled kudu fillet served with Shiraz reduction, caramalised onions, butternut, mash potato and a trio of vegetables. Then we shared a cheese platter with the farm’s preserves, roasted pecans and biscuits. The last course was a dessert of white wine poached pears with homemade vanilla ice-cream. All this was paired with Jan Harmsgat’s wines – Sauvignon Blanc, Blanc de Noir, Cabernet Sauvignon, Chardonnay and Viognier. I think dinner ended well after 22h00 with us two little piggies rolling into our king-size beds and snoring like hogs. A glorious “evening of food and wine” indeed! The next morning we were reluctant to leave our snug beds, but breakfast was calling (as if we hadn’t eaten enough already) and this was served on the restaurant patio. It was another beautiful day with the sunlight filtering through the pecan nut trees and bees humming in the roses. After a full English breakfast we took a stroll through the trees to the swimming pool, enjoying the roses, the manicured lawns and the small details, like the tap with a bird handle. 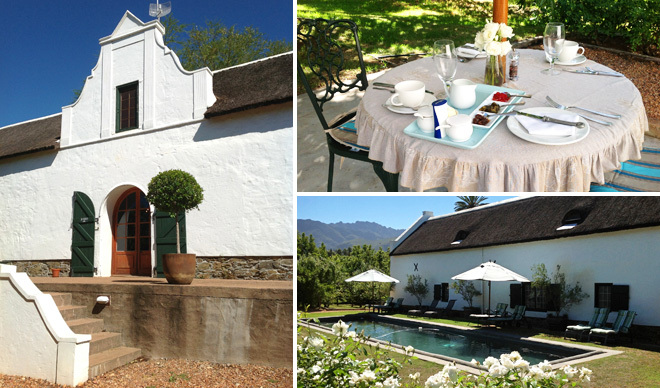 Everything at Jan Harmsgat Country House has been carefully thought out and designed with your pleasure in mind. Spend a night or two if you are in the area and fancy some pampering. As a matter of interest, ladies, it may be worth noting that Willie is single – he’d make a good catch! Tel 023-616-3407, www.jhghouse.com. The final stop on our Hands on Harvest weekend experience was at Arendsig Wine Estate in Bonnievale for a lunchtime feast with their winemaker, Lourens van der Westhuizen (who incidentally is the winemaker for Jan Harmsgat too) and chef Axel from the popular Mo & Rose. Everyone was instructed to wear white, which we did, and this created an “English afternoon by the riverside” scene, complete with a rowboat and croquet. 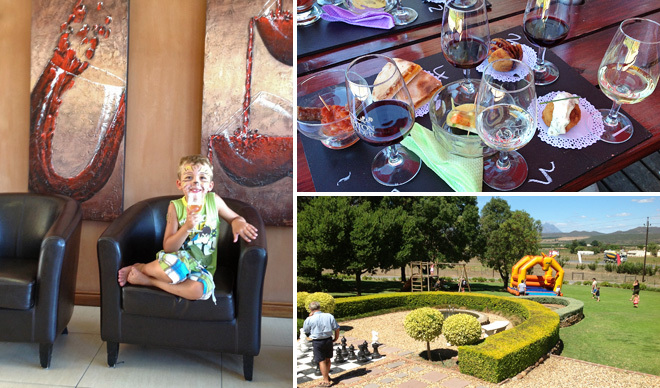 Lourens made time to chat to everyone while the wine flowed and the meat sizzled on the braai. We sat at tables under the trees and whiled away the afternoon. It was balmy and relaxed, just how a Sunday afternoon at the end of a good weekend should be! Tel 023-616-2835, www.arendsig.co.za. 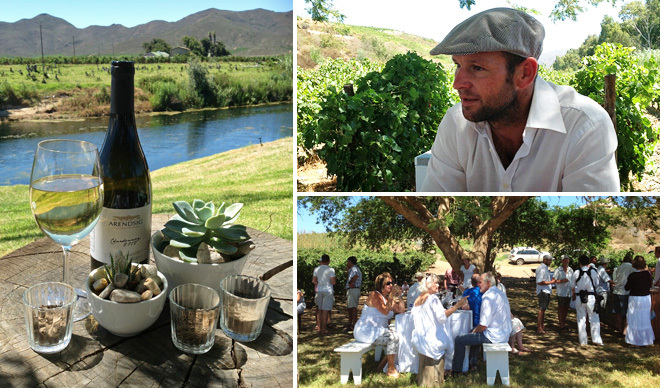 The Hands on Harvest is Robertson’s smallest wine festival, but it is probably the most intimate. It’s a great opportunity to meet the people behind the wines you buy, get to know the locals, drink some great wines and eat lots of delicious food. You’re likely to get your hands on a few bottles of wine too – our boot was clinking the whole way home with our new finds! We’re very glad the champagne from Weltevrede didn’t explode.